In 1939, Adolf Hitler was preparing Germany for war. Hitler's first target was Poland. Unfortunately, Poland was protected by both France and Britain, and if the two powers of Western Europe entered the war, the Soviet Union, the major power of the East, might also enter the war. In World War I, Germany had also learned the consequences of fighting a two-front war, so Hitler sought to keep the U.S.S.R. from fighting. 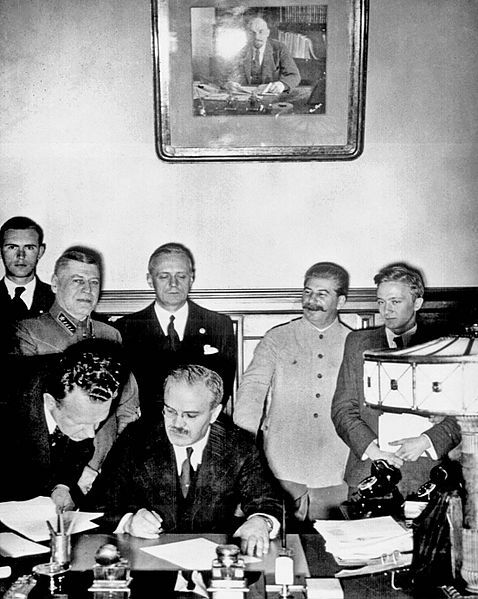 On August 14, 1939, Joachim von Ribbentrop and Vyaaheslav Molotov, the Foreighn Ministers of Germany and the U.S.S.R., respectively, met in Moscow to arrange the Nazi-Soviet Non-Aggression Pact. Publicly, the Nazi-Soviet Non-Aggression Pact was an agreement that Germany and Germany would not attack each other, but Ribbentrop and Molotov also included a secret protocol to the pact. In the secret protocol, the Soviet Union would not attack when Germany invaded Poland, and in return, Germany would give the Baltic States and part of Poland to the Soviet Union. Even after World War II ended, the very existence of the protocol was denied by the Soviet Union until 1989. On September 1, 1939, Nazi Germany attacked Poland, and the Soviet Union did nothing. Britain declared war on Germany two days later. The Non-Aggression Pact allowed Hitler to take Poland and fight the France and Britain without Stalin's intervention. The pact stayed in effect until June 22, 1941, when Hitler made a surprise attack on the Soviet Union, bringing Stalin into World War II.